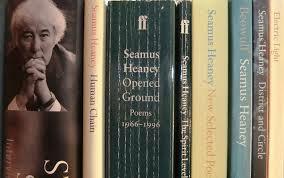 Our heading picture for this quarter’s posting is a reminder of the late and much-missed Seamus Heaney. Appropriately, themes of remembrance and reflections on mortality feature quite strongly in this issue, beginning with Murray Bodo’s delicate memorial to Seamus Heaney and Herbert Lomas. But there is also a leavening of lighter touch material in a selection of winter poetry that is both varied and generous – so generous in fact that (in contrast to the previous, relatively picture-rich, issue) there has been no room for illustrations to accompany the poems. Indeed, the editorial office was kept so busy simply with the tasks of choosing the best words and then putting them in the right order that there seemed to be no time even to search for complementary images. As London Grip New Poetry enters its third year we’d like to remind our readers once more that our parent site London Grip contains much more than poetry. It regularly features articles on art and theatre as well as book reviews (still mainly poetry but an increasing amount of prose). In between my three-monthly email alerts about new poetry postings, readers can be kept in touch with other material on the site by becoming a Facebook friend or Twitter follower of London Grip. If these technologies do not appeal, it is also possible to become a “subscriber” and to receive a weekly email notice of the latest additions the London Grip website. To be registered as a subscriber simply send me a request at poetry@londongrip.co.uk – there is of course no charge! Enclosed – for your signature. On waves that almost reached us. Murray Bodo is a Franciscan Friar. A member of the Franciscan Academy, he divides his time between Assisi, Italy and Cincinnati, Ohio, leading pilgrimages and writing. His latest book of poems, Something Like Jasmine, with accompanying CD of the author reading his poems, was released by Tau Publishing in 2012. ‘Johnnie’, surrounded by a buzz of chums. Struts creak and strain: the plywood frame’s aloft. from Maida Vale to Constantinople and Queensland. She settles to the bliss of solo hours. running away from the whole shebang. Before retirement, Ian House taught in England, Philadelphia and Moscow. His first collection was Cutting the Quick (Two Rivers Press). His second collection, Nothing’s Lost (also Two Rivers Press), is to be published in April 2014. He lives in Reading. and a wing tore open in my heel. shocked as a pilot bailing out of a perfect sky. we held up our hands, each with our own sensor. the bats flying out of the boarded up house. Earlier that day, some kids had tried to get through. the light like dead ashes and the dark filling up the woods. I felt my hand shake, mostly it was a low hiss. I dropped my sensor onto the grass. Louise Warren won the Cinnamon Press First Collection Prize and her book A Child’s Last Picture Book of the Zoo was published in 2012. She has also been widely published in magazines and anthologies including Agenda, Envoi, Fuselit, Genius Floored Poetry Anthology, The Interpreters House, The New Writer, Orbis, Obsessed with Pipework, Poetry Wales, The Rialto, Seam and Stand. In 2013 her poems were highly commended for both the Ver and Yeovil Poetry Prize. you raise yourself from a chair. whose doors are always ajar. Your perfume trailing behind you. I remember it was called: Wet Grass. Tugging at my hair and then pretending to be asleep. Your shivering shoulders always betrayed you. Legs galloping like wild stallions. You always look happy in that moment. Benjamin Smith is 28 years old and grew up in Hebden Bridge, West Yorkshire. He has spent the past three years travelilng around Latin America and is currently living in Mexico where he is working on a number of poems that draw on the influences of travel. This is his first published poem. Kerrin P. Sharpe’s first collection Three Day in a Wishing Well was published by Victoria University Press in 2012. Recently a selection of her poetry appeared in Oxford Poets 13 by Carcanet Press and also in Blackbox Manifold. She is also well represented in various other publications including Best New Zealand Poems. with our northern, vernacular brass. and hatch the image out. heads a monarch, tails Britannia. while the picture drew itself. I’d revealed a hidden talent. to make it into a flute. as if entombed in ice. like those on a whistle I played. I’m sure I could bring it to life. Stephen Claughton read English at Oxford and worked for 34 years as a civil servant in London. His poems have appeared or are forthcoming in The Interpreter’s House, Iota, Other Poetry and The Warwick Review. He has twice been nominated for the Forward Best Single Poem Prize. Martyn Crucefix’s most recent collection, Hurt, was published by Enitharmon. His translation of Rainer Maria Rilke’s Duino Elegies (Enitharmon 2006) was shortlisted for the 2007 Popescu Prize for European Poetry Translation. His translation of Rilke’s Sonnets to Orpheus was published in 2012.
of a white ladder, a spreading estate. they were born to hold death. in their veins. They will be my memorial. Sue Rose is a literary translator working on a children’s fantasy series billed as the French Harry Potter. Her debut collection, From the Dark Room, was published by Cinnamon (2011). A chapbook, Heart Archives, is due out from Hercules Editions in late 2013 and a second collection, The Cost of Keys, will be published in November 2014.
and rain and their progeny. Carol DeVaughn, American-born, has been living and working in London since 1970. Retired from full-time teaching, she is now preparing her first full collection. Her poems have appeared in magazines and anthologies and she has won several prizes, including a Bridport in 2012.
in a hurry—I am privation. a brooch celebrating the joy & sorrow of one life. Stephen Oliver is the author of 17 volumes of poetry. He has travelled extensively and signed on with the radio ship The Voice of Peace broadcasting in the Mediterranean out of Jaffa, Israel. He has free-lanced in Australia/New Zealand as a newsreader, radio producer, columnist, and much else. He has lived in Australia for the last two decades but is now spending an extended sojourn in NewZealand. His new volume, Intercolonial a long narrative poem published by John Denny of Puriri Press, dennyjhs@xtra.co.nz (2013) is as much about Australia as it is New Zealand. I cannot find him on the 1901 census. More than one Isaac Rosenberg is there. And all are dead, and all but him forgotten. of bone, in English cemeteries, filth of France. High Street. There’s a plaque for him, but he’d be baffled. and hear the dark doors quietly close behind you. who tried hard enough, God knows, to keep them out of it. and knew it was driving him mad, and his time was limited. the soft flesh under his battledress. Merryn Williams is a committee member of the Wilfred Owen Association, now preparing for the centenary of World War 1. She is the author of Wilfred Owen (Seren) and editor of The Georgians 1900-31 (Shoestring) and In the Spirit of Wilfred Owen (Wilfred Owen Association). Sarah Glaz’s poetry has appeared in Ibis Review, Convergence, The Mathematical Monthly, The Ghazal Page, Recursive Angel, The Humanistic Mathematics Journal, Talking Writing and other periodicals. She is professor of mathematics at the University of Connecticut, and serves as associate editor for Journal of Mathematics and the Arts. Uncle Donald made punctuality an art form. the clock in the bar had deceived him. public clocks, and the local park’s floral clock. but kept his other watches wound up & handy. was a masterpiece of planning & timing. happened on his way to the crematorium. and Uncle Donald shared a Humanist funeral. Brian Docherty lives in north London, member of Word for Word Writers Group. He has 3 books; Armchair Theatre (Hearing Eye, 1999); Desk with a View (Hearing Eye, 2008); Woke up this Morning (Smokestack Books, 2012). Smoke belches from the chimney, a siren buzzes. Two decks, a wheel house, passenger seats and cabins. and seven hours to its destination. The captain is a passenger’s friend and possibly under his command. but a flight attendant brings them champagne. demanding to turn back to point A. – What do we do? the captain asks. – Turn, the passenger orders. From point A there was fired a torpedo. despite the presence of a lady. Tatiana Bonch-Osmolovskaya was born in Simferopol, Crimea, former USSR. She is a graduate of the Moscow Institute for Physics and Technology and the Moscow State Humanitarian University. In 2011 she received a Doctoral degree of the University of New South Wales, for a dissertation on contemporary Russian experimental poetry. She has seven published books of prose, poetry and translations. As an artist she has participated in a number of exhibitions on arts and sciences, including Bridges conferences in 2012 and 2013. That sailor with his throat recently cut. That breeze of dark limits. That edge, love, that edge. the world you cannot cross without horses. These are the hills of hammers and the triumph of thick grass. These are swarming anthills and coins in mud. and the air at the exits of all the suburbs. It's the same, the same! Alleluia. and I am empty-handed in the murmur of the river’s mouth . What matters is this : void. The world alone. The river’s mouth. Only this: the river’s mouth. Oh my neck recently ripped! Oh my breeze of limits that are not mine! Oh edge of my love! Oh wounding edge! unplanted grasses all the hot dry summer long. Where has the prairie gone? that floods have never covered over until now. in a single day and night. Why is that helicopter circling my roof? for the dustbowl of my youth. Eight months – no rain. baked mud where rivers were. John Snelling has been writing poetry since the 1960s. In 1976, he won first prize in the City of Westminster Arts Council’s poetry competition. After this, success in competitions eluded him until, in 2013, he gained a Judge’s Special Commendation in The Poetry Box competition for dark and horror poetry. Vaughan Rapatahana is a Kiwi (Te Atiawa is his iwi or tribe) who is a long-term resident of Hong Kong, with a home also in Pampanga, Philippines. He is published widely in a variety of genre. of their journey further on its string. like the rapid ring of water round a flung pebble. day somebody spoke in Pomo. is simply the clothing of a deep look. Kate Foley’s 5th full collection One Window North was published by Shoestring Press in 2012. She lives, writes and leads workshops between Amsterdam and Suffolk. What is the future but this moment continued? What is the horizon but a shifting fiction? What is a fiction’s worth? That cannot be easily displaced. Unhindered by the fictions or the facts. What does both to its own advantage? Bettering me to face the facts and fictions of the day. by the rays of an afternoon sun. walks slowly to the shore. She might almost be keening. back up the shingle, to the car park and the village. until you find an email that scorches your fingers. “But the words mean nothing”. that is skim-read then trashed. you unlock his phone with fumbling fingers. pointing to a website that punches you in the face. gets his foot back in the door of your life. him meeting a broadminded couple for coffee…. Fiona Sinclair is an ex-English teacher. Her third collection Wonderland was published by Indigo Dreams Press in May 2013. She is the editor of the on-line poetry magazine Message in a Bottle . I was walking down the amusement street. Night, neon red yellow white flash stripes. When she. Thousands moved, but she. Stood upright. Blur short red-head. So I walked up to her and said. blowing snow over an ice plain. But I invited. And much to my surprise. To the bar. To the booth. Where she placed her purse beside her. Trim little body. Aging face high cheek bones. Indian? French? Red tousled short hair. My name is, I said. My name is, she said. and gradually. Gradually. Sinks within. Who are you? she asked. I am a man. Couldn't be eager. No one is eager. Couldn't wait. No one waits. she cannot fly too close to it. chunks out of it with her mouth. known she is the more mysterious. there are along the way. and the procreation of the species. Gordon Meade is a Scottish poet now living in London. His seventh collection of poems, Sounds of the Real World, was published in September 2013 by Cultured Llama Publishing. Mournful tone of a trumpet. Jewelled phrasing of piano. Purple brown smoke miles away from duet. Clouds regrouping into more smoked clouds. Pretending to be ominous, as they pattern like a tornado. Tiny insect police helicopter flying into a clearing. Lights come on. Deflecting all these sunset entered rooms. Houses, flats, hotels prepare themselves for evening. Traffic begins to flow quicker. A road tinted by destinations. Trumpet binds piano to ruminate downwards into night. This twilight of droning music and passing moments. A playful sense of a day’s completeness. I could die, just now. Fulfilled. Content. Who else can ever receive this properly? Really see or hear what these things couldn’t express? Their words are here for you to take. Alan Price is a North London based poet. His work has appeared in many magazines. A debut poetry collection Outfoxing Hyenas was published by Indigo Dreams in 2012.